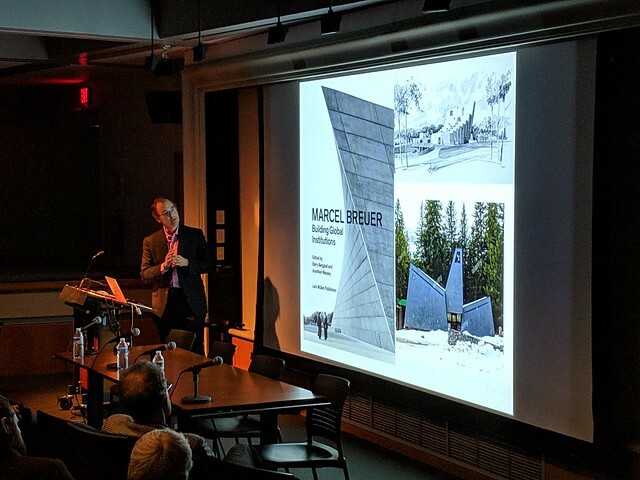 In addition to being a furniture designer and teacher, Marcel Breuer is one of the most influential modernist architects of the 1960s and 1970s. Breuer’s Brutalist architecture is reaching an expanded public thanks to a renewed interest in his buildings and urban designs—specifically with the reopening of the iconic Whitney Museum, now known as the Met Breuer. In the new essay collection, Marcel Breuer: Building Global Institutions (Lars Müller, 2018), leading scholars draw on newly digitized archives to interpret the architect’s corporate headquarters, research labs, campuses, churches, housing complexes, and city plans. Together, they show us how Breuer’s heroic and complex modernism gave shape to the institutions of global postwar society. Please join us on Monday, March 4th at Betts Auditorium for presentations by the editors Barry Bergdoll and Jonathan Massey, along with authors Lucia Allais and Guy Nordenson, followed by a Roundtable discussion on Marcel Breuer: Building Global Institutions. Event made possible by the Jean Labatut Memorial Lectures in Architecture and Urban Planning Fund. The School of Architecture, Princeton University, is registered with the AIA Continuing Education System (AIA/CES) and is committed to developing quality learning activities in accordance with the AIA/CES criteria. Marcel Breuer: Building Global Institutions is available with free shipping at artbook.com.